Open-Face Chinese Poker with 2-7 in the Middle -- a.k.a. "2-7 OFC" or "Deuce Pineapple" -- offers yet another exciting and fun twist on the popular variant. Open-Face Chinese Poker with 2-7 in the Middle — a.k.a. “2-7 OFC” or “Deuce Pineapple” — is a turn-based card game that is played heads up, or sometimes three-handed. Players take turns, drawing cards and placing them into three separate poker hands. Each of these hands is played face up, meaning that players can see all of the cards that have been played, and these cards can’t be moved between each player’s three poker hands once they have been placed. The “Deuce” designation means that the middle poker hand is played according to the rankings used in 2-7 lowball, while the other two hands are played as regular “high” poker hands. The game might sound complicated, but it really isn’t. The objective of 2-7 Open-Face Chinese is to place 13 cards into three hands: a five-card bottom hand, a five-card middle hand, and a three-card top hand. 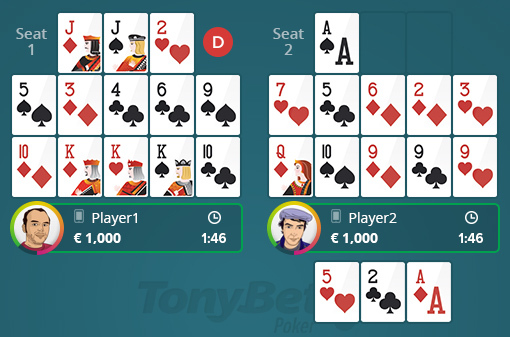 As noted, the game plays just like high-only Pineapple OFC, except with the middle played as a 2-7 lowball hand. This means that your bottom hand is a regular five-card poker hand (with flushes, straight and full houses), the top hand is a three-card high hand (including pairs, trips, but no three-card straights or flushes), while the middle hand must contain five low cards with no pairs, no straights, and no flushes. The lower these cards the better. The game is called Open-Face Chinese Poker (or OFC for short) because you’re building these three hands face up a few cards at a time. 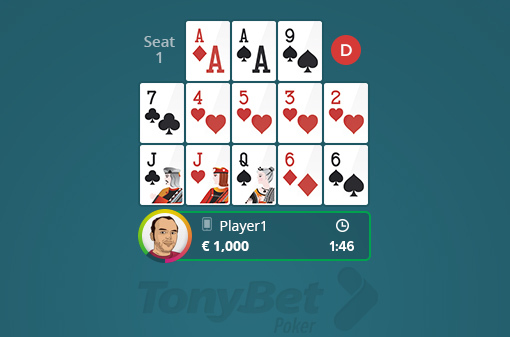 As with all Open-Face games, you start by getting dealt five cards and place them all. On subsequent turns (following the procedure used in Pineapple OFC), you get three cards face down and place two of them in any of the available rows (bottom, middle or top). The unused card then gets discarded face down. Discards are out of play, and not shuffled back into the deck, and your opponents are not allowed to see your discards. Therefore there are only enough cards in a deck to play Deuce Pineapple OFC either heads-up or three-handed. 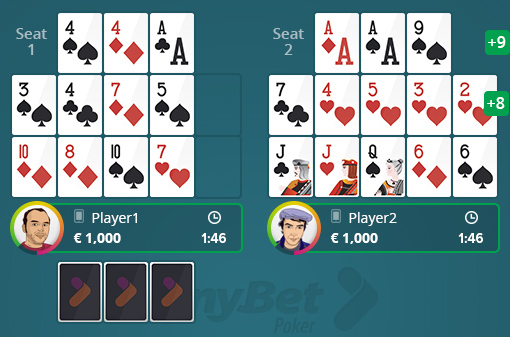 If you make a qualifying hand with kings or better up top, or a wheel — — in the middle, then on the next hand you enter Fantasyland. Just like in high-only Pineapple OFC, in Fantasyland you get 14 cards right away and set 13 of them into three rows face down while discarding one. Your opponents then play out their hands normally, and the result is scored against your hand. You can stay in Fantasyland, earning another round in this advantageous position, by making a big enough bonus. For Deuce Pineapple you need either trips (three of a kind) on top, a wheel low in the middle, or quads (four of a kind) or better on the bottom to remain in Fantasyland. This double-bonus is rare, but well worth it. If you stay in Fantasyland, “Super” or otherwise, you get a normal 14-card Fantasyland hand. To make a qualifying hand, your top hand must be no better (as a normal poker hand) than your bottom hand. And your middle low hand must be at least a ten-low, meaning that your biggest card is no higher than a ten without a pair, a straight, or a flush. As with other Chinese Poker variants, a disqualified or “fouled” hand automatically loses every row. The three rows are scored against your opponent with the winner of each row getting +1 point. If you win all three rows, this also results in a +3 scoop bonus. In addition to winning, scooping, and possible Fantasyland qualification, you also get points for any bonuses earned by a qualifying hand, even if that hand loses the row. There you have it. 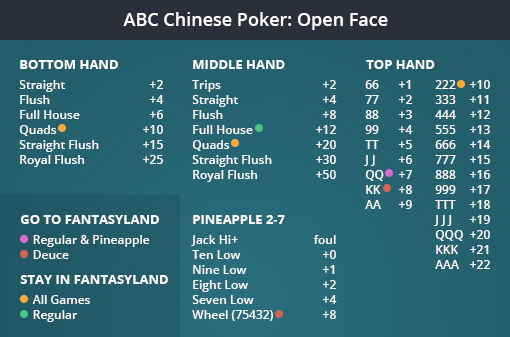 Welcome to Open-Face Chinese Poker with 2-7 in the Middle — or “Deuce Pineapple” — now available at TonyBet Poker.